Over the years there have been a number of highly contested battles — Coke vs. Pepsi, Lakers vs. Celtics, Ali vs. Frazier. In the world of investing, there’s also heated rivalry: active vs. passive. Recently passive investing has gotten some extra muscle thanks to its newest champion: billionaire investor Warren Buffett. A decade ago Buffett, chairman and CEO of $517 billion Berkshire Hathaway, famously wagered $1 million that the S&P 500 stock index would outperform hedge funds, which he described in a 2016 letter to Berkshire Hathaway shareholders. Buffet’s claim was that over the span of ten years active investment management by professionals would actually underperform the returns by amateurs who were passively investing with index funds, after fees, costs and expenses. But only one person took the bet: Ted Seides, a former co-manager of Protégé Partners, a specialized asset management and advisory firm. The wager was made and the tortoise and the hare battle began: Buffett’s low-cost Vanguard index fund returns vs. Seides’ group of handpicked Protégé hedge funds. The result? With a few months left to go in 2017, Seides has conceded. That’s because he was getting smoked by Buffett’s passive strategy. Seides’ five funds-of-funds gained 2.2% on a compounded annual basis in the nine years through 2016, versus 7% for the S&P 500. According to Buffett, $1 million invested in those hedge funds would have gained $220,000. Meanwhile, the Vanguard index fund would have gained $854,000. (The good news: all proceeds of this wager are going to charity). For regular readers of our blog a lot of the message of this story should sound very familiar: low-cost index funds on a long-term basis are the key to getting the most return for your risk budget. However, for many the passive position Buffett took came as a surprise. But this wasn’t the first time Warren Buffett was contrarian. In his 2013 Berkshire Hathaway annual report and shareholder letter he caused quite a stir by revealing his “90/10” plan for the assets he was bequeathing to his wife upon his demise. Buffett recommended that 90% of the cash would be put in a very-low cost S&P 500 index fund while the other 10% would be allocated to short-term government bonds. People were so shocked because — at that time — it felt like the ultimate contradiction: an endorsement of index investing from the man who was thought of as one of the greatest stock pickers of all time. It also probably left many people questioning the various portfolio allocations and ratios their own financial advisors had put them in. We had a different question: how does a diversified portfolio (similar to those offered by Wealthfront) compare with Buffett’s 90/10 investing strategy over time? What we found was that someone implementing Mr. Buffett’s advice would have actually been better off investing in the diversified portfolio. To illustrate this point, let’s compare the average risk-adjusted return from a hypothetical Buffett 90/10 portfolio over the past 15 years (from July 1, 2002 to June 30, 2017) with what could have been expected from a well diversified portfolio over the same time period if it had existed. To evaluate the Buffett 90/10 portfolio we calculated returns on a portfolio that is 90% allocated to the S&P 500 and 10% to short-term U.S. Treasury securities. 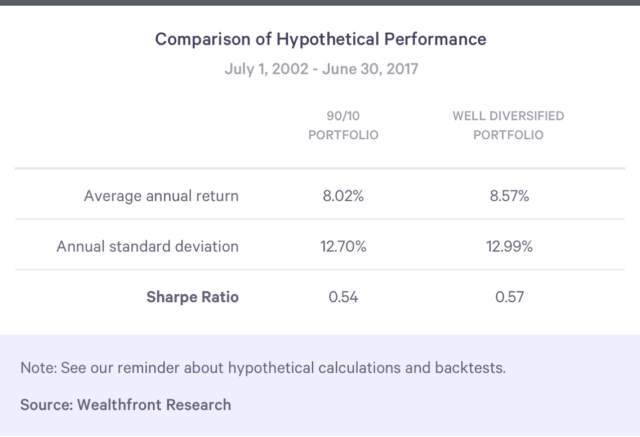 To represent the diversified portfolio we created a hypothetical portfolio with an asset allocation similar to what one would find in a taxable risk level 7 portfolio employed by Wealthfront (risk level 7 is the average risk level for all Wealthfront clients). The diversified portfolio included allocations to municipal bonds, treasury inflation protected securities (TIPS), dividend growth stocks, U.S. stocks, foreign developed stocks, emerging markets stocks, and commodities. To calculate risk-adjusted returns we used the Sharpe Ratio, the industry standard metric for such comparisons. The Sharpe Ratio was first proposed by Bill Sharpe, the co-recipient of the 1990 Nobel Prize in economics for Modern Portfolio Theory. The more diversified portfolio had a higher average annual return and a much higher risk-adjusted return than Mr. Buffett’s recommended portfolio. Why? Because the more diversified portfolio is diversified globally across seven asset classes, while Mr. Buffett’s is composed almost entirely of U.S. equities. As we explain in our investment methodology white paper, adding relatively uncorrelated asset classes to a portfolio almost always increases the return for a given level of risk. You begin to see radically diminishing returns when you attempt to broaden beyond seven asset classes. Mr. Buffett most likely suggested a very simple two-asset class portfolio because of its low fees and lack of familiarity with such new cost effective approaches as automated investment services. To be fair, over the past 15 years the returns of Berkshire Hathaway have outperformed the average diversified portfolio. That said, Warren Buffett is a once-in-a-lifetime investor, which is probably why he recommended that his family choose index funds once he is gone, as well as his general belief that the average investor should opt for a diversified portfolio of index funds. And with his highly publicized “victory” over Ted Seides, we’re hopeful more people will come to appreciate the value of low-cost index funds and a passive investing mindset when it comes to long-term performance. This information is based on hypothetical performance calculations, which are not an indicator of any investor’s actual current or future experience and is provided for illustrative purposes only. All investing involves risk, including the loss of money you invest. Hypothetical performance calculations are developed with the benefit of hindsight and have inherent limitations. Specifically, these results do not reflect actual trading or the effect of material economic and market factors on the decision-making process. Wealthfront assumed dividend and interest reinvestment, that we would have been able to purchase and/or sell the securities recommended by our models, that markets were sufficiently liquid to permit those trades, and the expected returns are in no way guaranteed. You should evaluate this information carefully before you invest, and consider Wealthfront’s processes, the data we used, and the assumptions we made in developing our hypothetical calculations. To calculate the results for the 90/10 portfolio, the historical performance of VFINX and VUSXX were used from 7/1/2002 to 6/30/2017. To calculate the results for the well diversified portfolio, the historical performance of the following instruments were used over the following periods to represent the seven asset classes. For certain asset classes, more than one security was used because certain securities did not exist for the entire period of the backtest.